I am sorry, but today’s post will probably bore you unless you are a doll-collecting, obsessive-compulsive bag of mixed nuts like I am. These are the kinds of details that only interest the true collect-a-holic. 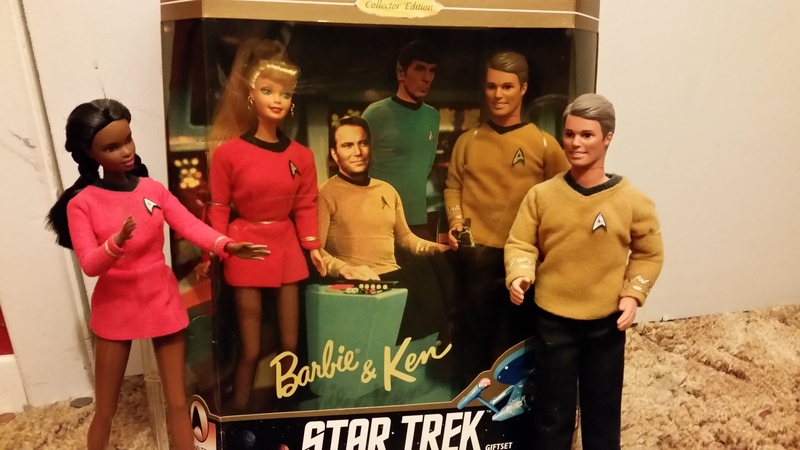 You see in the picture my mint in-the-box Star Trek Barbie and Ken, 1996 30th Anniversary Edition. It was a difficult track-down. Now, you Google it and you can get one for 25 dollars on e-Bay without breaking a sweat. When I got hold of this in 1998, however, it was a bit tougher to find. It started with a trip to Goodwill. My wife loves the bargain clothing and especially the shoes. (She’s from the Philippines and has a touch of Imelda Marcos Footwear Disease.) While there, with my young son in tow, in the toy section… I discovered two loose Barbie and Ken dolls that actually weren’t naked. Barbie’s head was severely damaged, and she had lost a leg. Ken was in practically un-loved, un-played-with condition. Both had uniforms. The Star Trek uniforms you see here on the two figures in front. (Ken was missing the shoes, phaser, and communicator, but the original accessories were pretty small and pitiful anyway. Barbie had no fishnet stockings and no shoes, along with no working head.) Of course I had to buy these wonderful items. They cost me 25 cents apiece. Gonga! I hadn’t known that such a 12″ action figure existed! (Okay, really a doll, but, you know…) I immediately began a search of toy stores and junk shops in South Texas. At the time we had relatives in Dallas. So I went prowling there too. You wouldn’t believe the looks I used to get from parents wondering what a forty-something old man by himself wanted in the Barbie section of KayBee Toys. Now they see my gray hair and figure, ah yes, shopping for his granddaughter (of which I have none, but I digress.) Finally I found the rare item in a San Antonio flea market stall. And it only set me back fifteen dollars. Wotta find! It made my goofy old collector’s heart glad for a couple of months afterwards… heck, that’s not true either! Sixteen years later it still makes me giddy. Non-collectors can’t understand. I’m not into dolls, but when I go to Paris every year I buy old comics albums. On the banks of the Seine. i have a very complete list of what I have and don’t have. Holes in the collection must be completed. And sometimes, when you buy an old book, it needs to be restored. I know how to bind books and use that to restore worn-down editions. So konw perfectly what you mean. It is wonderful to know I am not the only collect-o-maniac in the world. When we need a room just for dolls and a room just for shoes… I’m thinking disease isn’t far from accurate. My propensity for gathering as many pens as possible in all of the different colors possible is not a far stretch from your doll collection. Or my yarn stash, or my fabric stash, or my stash of loom bands–you know the Rainbow Loom craze that happened in the past few years? I have a book problem too, or that’s what my husband says. I for one think that there is nothing abnormal about wanting to surround myself with piles of books. They are beautiful things to behold. Yeah. I collect too. And I get it. I am not ready to make confession about my library.